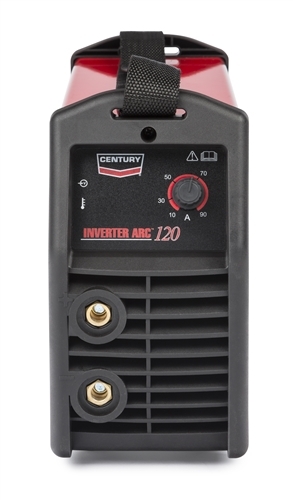 The Century Inverter Arc 120 Stick Welder is compact for portability and has a 10 to 90 amp output that supports mild steel stick electrode diameters from 1/16" to 5/64". The smooth arc provides strong welds on 18 to 14 gauge sheet metal. It has a 20% duty cycle that allows it to run 2 minutes out of each 10-minute period without overheating. A continuous amperage control permits exact temperature setting for consistent welds. 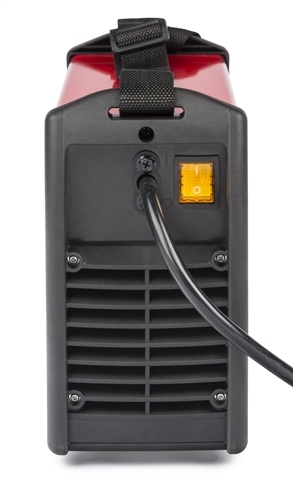 It comes with a shoulder strap, work cable, electrode holder, work clamp, and input cable with attached plug. 10ft ground clamp and cable assembly. 10ft electrode holder and cable assembly. 6ft power cord with attached 120v plug. One year parts and labor warranty on unit. 90 days on cables. Use the following welding rods with this welder. 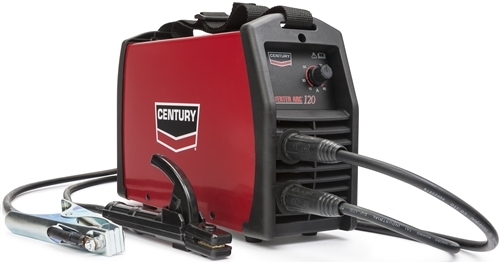 - E6013 1/16", 5/64" or 5/32"
10-90 amp DC welding output range. 20% duty cycle at 70 amps. Unit dimensions: H=9", W=4.5", D=14". Welds 18 gauge to 1/4" single pass. © Copyright2012 weldingandcutting.com. All Rights Reserved. Built with Volusion.